The real difficulty in discussing the ‘Alt Med’ is encapsulated in this piece by the US movie maker, Eric Merola. He has made it his mission to publicise the controversial Burzynski clinic in Houston Texas and has made two movies which are largely sympathetic with the trials and tribulations of the ‘oppressed’, and self-styled cancer Doctor. When discussing issues of this sort, one cannot escape the fact that there are real patients involved. This makes a rational discourse virtually impossible because so much is at stake. Family members are as emotionally involved as the patient’s themselves. No one can criticise the wider family and friends for caring and being full of hope. However, those interested in medicine and science in general have a legitimate concern over how the evidence stacks up for approaches like that of the Burzynski clinic. This particular Movie maker campaigns on an emotional platform that plays on the vulnerabilities of those afflicted and uses non-scientific methodology to justify claims that Doctor Burzynski cures some of the most difficult cancers. 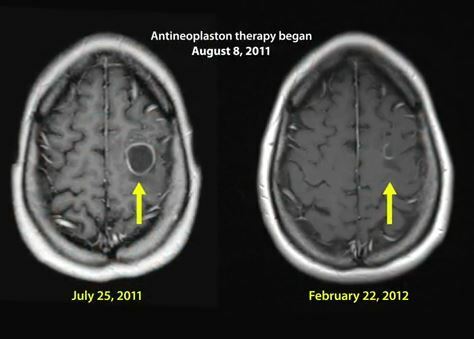 The screen shot above is from Merola’s latest vignette which highlights one such patient, Laura Hymas (The piece is linked here) Laura was diagnosed with an aggressive Grade IV Glioblastoma brain tumour which she had early treatment for on the UK’s National Health Service (publicly funded health care for all patients) Average survival of this cancer is 4 – 6 months without treatment and 1 – 2 years with treatment. There is no cure for this type of cancer. According to the movie maker, Merola, The Burzynski clinic has found a care for this disease. The world’s scientific community has not seen any reproducible scientific data that would corroborate Merola’s and the Houston clinics that this treatment works. 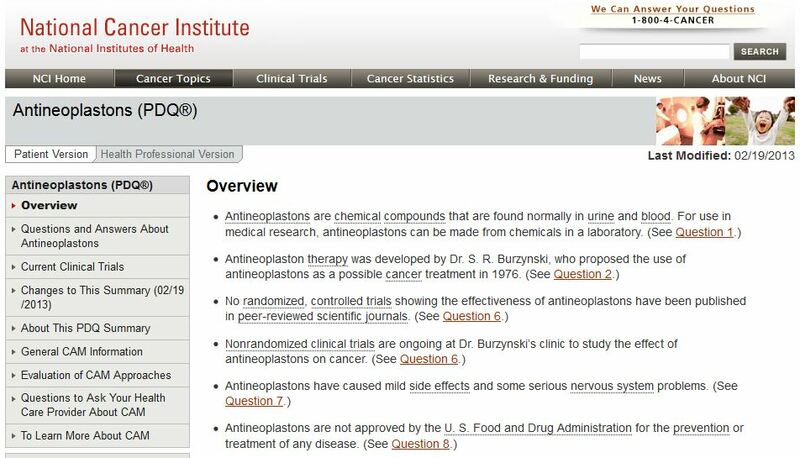 Recent World and European cancer congresses in Chicago (ASCO) and Amsterdam (ECCO/ESMO) gave no mention of Antineoplastons at all. This piece shows the painful decisions that have to be made by people like Laura and her now husband, Ben. 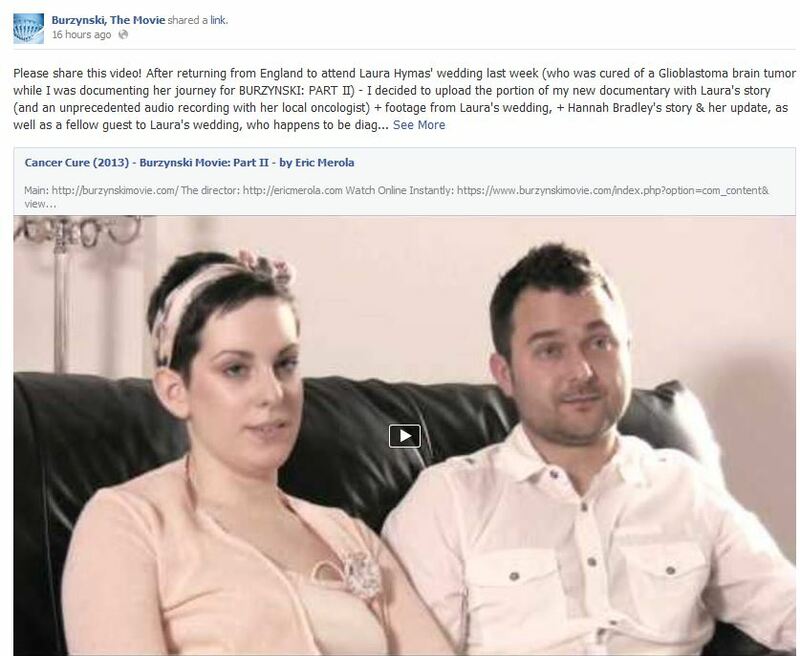 The movie shows the family in an unauthorised taped interview with a UK oncologist, trying to persuade him to support Laura during her treatment journey whilst in the UK. The whole family can be heard questioning the Doctor in an excruciatingly embarrassing fashion. They could not accept his conviction that there was a) no evidence for this treatment and b) there was no formal mechanism for him to treat Laura whilst on Doctor Burzynski’s trial. In the end the oncologist had to walk out as the family (understandably) would not accept his position. As I have already said, you cannot criticise the motives of the family but to secretly record the oncologist and to go as far as they did, in terms of pressurising him to concede, was questionable. Whose idea was it to record the conversation, why was permission not sought from the Oncologist, what motive did they have for recording it? In the recording Laura’s Mother reiterated the treatment was ‘FDA Approved’ – this is misleading. The treatment itself is not FDA approved. The trial is but that is an entirely different thing. Many patients are confused by this statement. I wonder if the Burzynski protagonists are quite happy creating this confusion? These are all questions that probably won’t be answered. What is clear is that the clinic and Merola’s key weapon was the absolute desperation to do something positive. Evidence presented by the movie man comes in the form of the fact that at her wedding, Laura appeared well with Merola claiming that she is now cured of her cancer. This is a very bold statement to make when one considers that the word is waiting for cures for cancer. The evidence presented by the piece is interesting. It mainly forms Laura and Ben talking about how well she is nowadays (13 months into treatment and 9 months since the tumour disappeared) Laura is now on ‘maintenance treatment’ to mop up any tumour cells left behind. Anyone reading this will be happy for them both and would wish that her wellbeing continues for many years to come. What is interesting about the piece is, despite Eric Merola telling the world that Laura is cured ‘After returning from England to attend Laura Hymas’ wedding last week (who was cured of a Glioblastoma brain tumor while I was documenting her journey for BURZYNSKI: PART II) yet in the video we see Laura telling us that she can now walk up the stairs and go out. Let’s hope this continues. The scans that Merola presents by way of showing tumour reduction are worrying in that the images are not taken at the same ‘location’ the cuts /views need to be at identical reference points to make an objective evaluation, they are clearly different in this image. You can see varying levels of anatomical reference points. The image to the left is a slice taken higher up in the brain where the one on the left is taken lower down. The effect of this is that you are seeing the bottom of the tumour which naturally looks smaller. Merola (and presumably the clinic) make the point that this proves it has shrunk. The Burzynski clinic has long had a reputation of confusing findings on scans; again, let’s hope they are right on this one. Back to the difficulty of discussing these matters – no one would deprive any patient like Laura of her chance to improve their outcomes in difficult circumstances. However, the evidence that it is this Doctor’s treatment is making the difference is patchy. The data is weak, the scans are questionable, and the ability to reproduce the findings does not exist. The treatment is at vast expense and is ‘managed’ by the clinic by putting patients into so called ‘clinical trials’. The clinic has registered a total of 61 clinical trials in nearly 36 years. In all this time the clinic and yet have only reported on only one. This is strange when the likes of Laura say they are on a ‘trial’ but no data is ever reported (apart from very early stage data which doesn’t have the strength of efficacy to determine if a treatment will go on to work in a general population) It is worth reminding ourselves that clinical trials normally ask patients to enter them for free. Laura and Ben highlight how much the treatment costs and it is huge amounts of money. Are the vast fees to gain access to this trial acceptable? To some, this is simply a business where the clinical trials are a cover for a maverick Doctor wanting to make substantial money out of the sick and desperate. The film maker and the clinic believe that their treatment has material benefits to the patient’s they treat. It is unfortunate that they use the ‘Big Pharma doesn’t want us to succeed’ card. They position themselves firmly in the alternative medicine arena with all of the vague notions of efficacy that go with that. Whilst the world waits for a breakthrough for cancer, it cannot be left to film makers and rogue Doctors to determine that they have achieved this lofty aim. The world needs to see some tangible form of real evidence that this treatment has potential. Until this time there will be many patients like Laura Hymas who succumb to the hope that it will be ‘them’ that gets the benefit of a treatment. Generally speaking it is the desperate and broken who succumb to this form of marketing. There will always be the Laura’s in the world and there will always be Burzynski’s but with the greatest of respect to both of them, movie makers and the odd patient story here and there will not convince health authorities around the world to approve a treatment which has not demonstrated to any acceptable measure, that it indeed works effectively.